I want to go to Austin! Science Friday: Mars rover having "amnesia"
Here's an appropriately dorky topic for today's Brane blog. 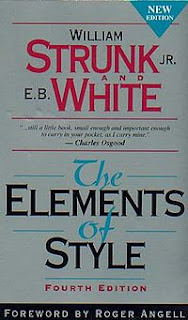 Evidently, the famous and even beloved bible of the grammar police, The Elements of Style, turned fifty today (roughly). Originally written by Strunk circa the Great War-era and much later reworked by his student E.B. (Charlotte's Web) White, this little style guide has been a bossy mainstay of the academy and the cudgel of copy-editors for decades. During my college days, I found it utterly tiresome and have to confess that I have never been able to find the kernel of its English-major appeal anywhere in it. So I was delighted today when NPR's Talk of the Nation interviewed linguist Geoffrey Pullum whose new article "50 Years of Stupid Grammar Advice" is available from The Chronicle of Higher Education. It was refreshing to finally hear someone debunk the notion that a split infinitive is some sort of cardinal syntactical sin and to finally explain to me why the hell the grammar check in Word wants me to change every single "which" to "that." explain to me why the hell the grammar check in Word wants me to change every single "which" to "that." Do me a favour - explain THAT to me, please. The best thing I've ever read on grammar and language usage is Bill Bryson's book The Mother Tongue: English and How it Got that Way. Maybe I'm just a nerd, but I think it's hilarious while at the same time highly informative. It debunks a lot of stupid grammar rules (like not splitting an infinitive)and explains where they came from (apparently in Latin it's improper--or impossible?--to split infinitives, so stuffy scholars imposed the same rule on English). It's a must read book for writers and readers interested in how honked up the English language is. I can't thumb my way through more than a page of Strunk & White without my eyes glazing over in boredom, but Bryson somehow turns a droll subject into a page turner. Martha, evidently one is supposed to use "that" rather than "which" unless it is preceded by a comma. I had not remembered such a silly rule from my own reading of Strunk ages ago (and didn't care to look it up again), but Pullum mentioned it during the interview on NPR. I have long found it to be an annoying tick in the Word grammar check, it putting that little green squiggle under every "which." I have found myself puzzling over it and even changing it occasionally, only to find myself saying, "No, this is definitely a 'which' situation!" Garret, good rec on the Bryson book. I'm not very familiar with Latin grammar, but I remember learning that when I took German that the German language (which is closely related to ours) hangs on to a lot of Latin grammatical stuff (like some of the weirder case inflections), but in German the splitting isn't really the same issue because the infinitives for the most part are single words (e.g. ours is "to go," theirs is "gehen", which then changes form depending on tense, etc. )...except they have a bunch of verbs with separable prefixes where those prefixes MUST be split from the verb root, and I suspect that a lot of ways of saying things in English probably come from that. Tedious and geeky but kind of fun. (Btw, I managed to split an infinitive a couple times in my sentence about the topic). I got something out of the Strunk book when I was 16, and I still have that same copy!, but I think, at least for creative writing, the trick is to know the rules well enough to understand where I'm breaking them and why. I recall tho, that some of the rules I could never really understand anyway. -text in place of missing example-. Apparently there's a semicolon rule as well that I am not privy to. I like my semicolons. oh, and I go back and forth when it comes to the blog: do I write like I speak, or do I try to follow the rules? I tend to be informal unless I'm reviewing something, and even then I'll drop a :) if I feel like it. Well said, Brandon. All of it. In "business" language (IT and many other areas, I'm sure) passive voice seems to be standard and even necessary if you want to not come across like a jerk. "A mistake was made with blah, blah, blah" versus "You made a mistake." As for blogging, I decided that writing like I'd speak is best for me, though I occasionally back up and change something when I look at in text and wonder if anyone will understand the meaning of it. That's also how I handle "editorial" stuff that I write in the M-BRANE zine. I have gotten some feedback that my informal tone might make the publication seem fanzine-ish and less than professional, but I don't really care about that. Understanding the "rules" and the natutal flow of language is certainly the trick to making it work when breaking the rules. It's part of that indefinable thing that makes some writing readable and some not. I have read a LOT of stuff by technically competent very grammatical writers that is just plain horrible somehow (a lot of business and academic writing is like that). E.B. White himself did not write strictly according his rules as laid out in Elements of Style. If he had been so strict, then Charlotte's Web might not have been the classic it is.